Welcome to the Skipping Stones Design Team New Release Blog Hop featuring tags created (mostly) with the brand new Victorian Christmas set! I don't know why the color came out so bright on the red. The reds aren't really that day-glo color. 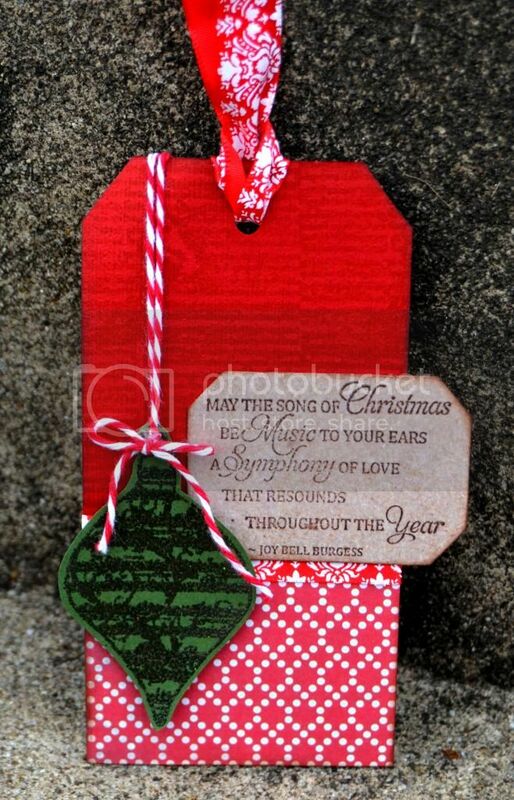 The red cardstock base is more of a brick red and I stamped the music note stamp on it in a darker red ink. On the ornament, I stamped it in brown ink then embossed with an opalescent embossing powder. Beautiful! Your tag is perfectly festive is every way! Megan, this is so pretty! I love the sentiment~fantastic tag! Love your bright bold colors! Very striking and festive! Great work. This is so pretty with the lovely ribbon and the twine.